Print History: Edition of 300. 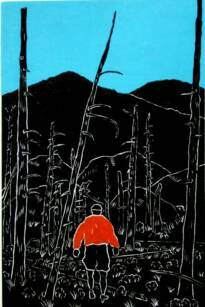 Image came from a backpacking trip to Rocky Mountain National Park in July, 20009. 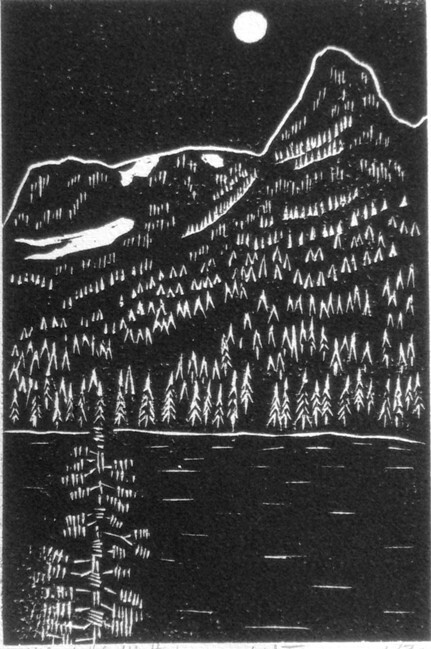 The Little Matterhorn mountain looms over Odessa Lake. Print History: Edition of 300. Image came from a backpacking trip to Rocky Mountain National Park in July, 2009. Mill Creek crosses the trail from Tourmaline Gorge as it drops down to Bear Lake. Print History: Edition of 200. Image came from a hiking trip to Rocky Mountain National Park in July, 2009. Odessa is one of the many glacier carved lakes in the park. Price: $70 for print alone, or $75 matted. Print History: Edition of 300. Image came from a hiking trip to Rocky Mountain National Park in July, 2009. I was struck by the beautiful mountains in the background of this expansive meadow. I plan to do more color prints. This is a start. Price: $74 for print alone, or $77 matted. Print History: Edition of 100. Image came from a day hike on Mount Lemon, on the outskirts of Tucson. At the top of the mountain was a trail through an area that had been razed by a forest fire. The underbrush had started to come back, but the trees were dead. It seemed to me a spooky place. Price: $75 for print alone, or $80 matted. 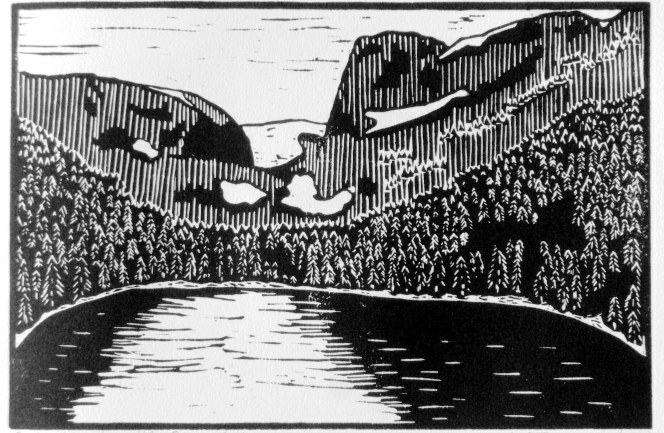 Print History: Edition of 100. Image came from a trip that my wife and I took to Hawaii in March 2013. Pearl Harbor is such a beautiful location that it's hard to conceive of the horror that our service personnel experienced here on Dec. 7, 1941. Any U.S.S. 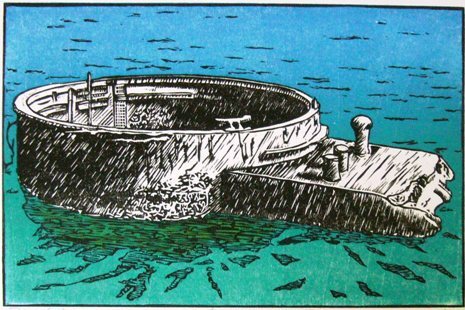 Arizona survivors, when they die, can be cremated and have their ashes placed in the hull of the sunken ship. There the men will be at rest with their fallen shipmates. Print History: Edition of 200. Image came from a day hike in Catalina State Park on the northern outskirts of Tucson. 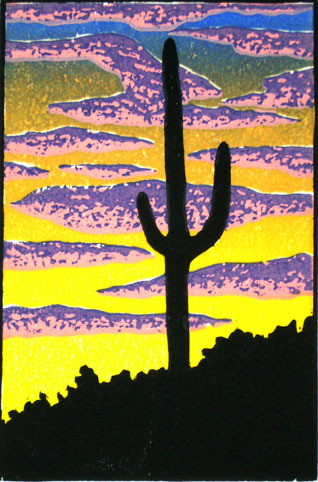 Hundreds of saguaro "sentinels" such as this one were silhouetted against the sunset. After dark, the coyotes started to howl -- all this within five minutes of a large mall with a Wal-Mart. Price: $79 for print alone, or $82 matted. Print History: Edition of 100. This is a large, nine-color print. 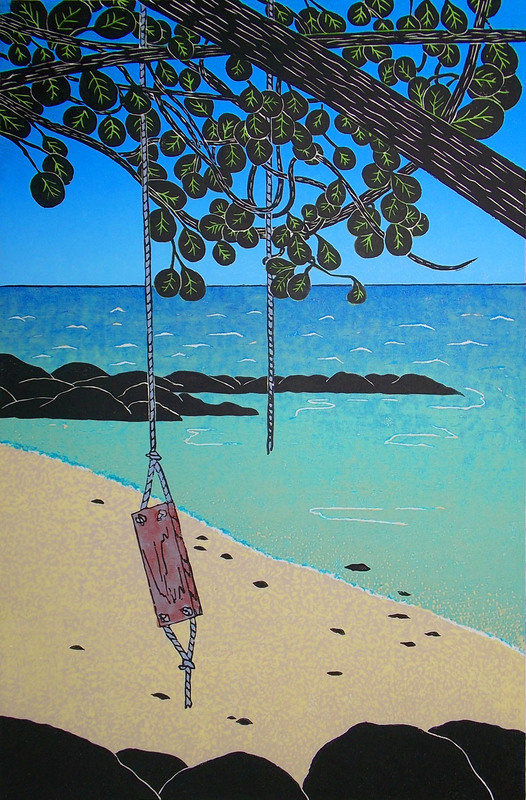 The image came from a trip that my wife and I took to Hawaii in March 2013. Hanalei Bay is on the north shore of Kuai, generally regarded as the most beautiful of the Hawaiian Islands. Movies have been filmed at the bay, surfers love it, and the whole area is steeped in history. Many thanks to our friends Peter and Judy, who introduced us to this lovely part of the world. Price: $251 for print alone, or $269 matted. Print History: Edition of 200. 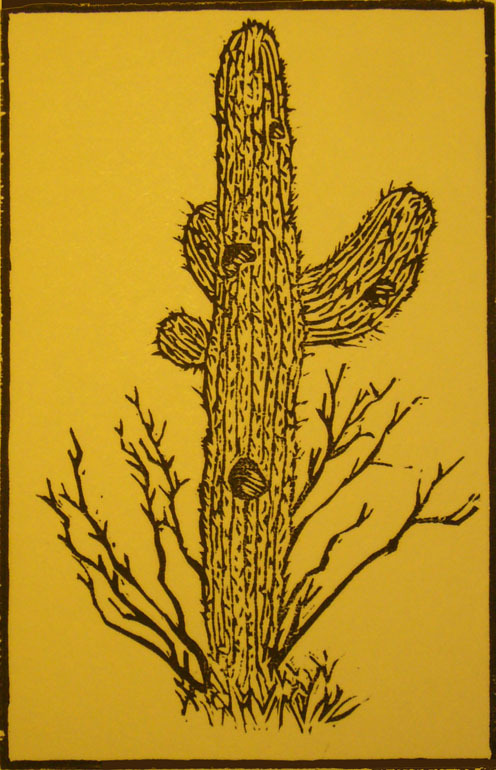 Old Saguaro is printed on cream colored paper. The image came from a hiking trip I took about a year ago to Catalina State Park near Tucson. This saguaro looked like it had experienced a hard life. It was full of holes from birds making nests and just generally looked kind of beaten up. It caught my eye and I made a quick sketch. Print History: Edition of 100. 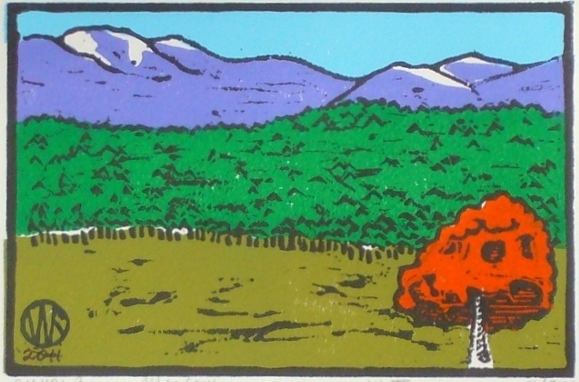 This is a large, eight-color print. 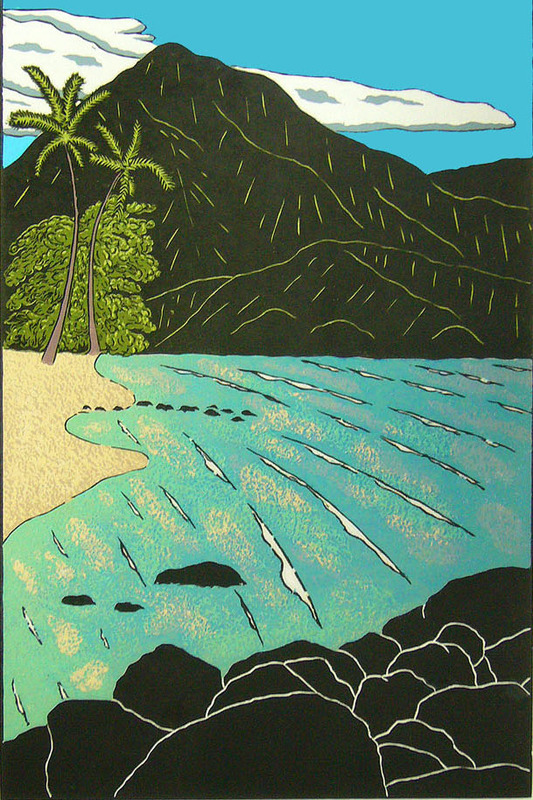 As with the print of Hanalei Bay, this image came from a trip that my wife and I took to Hawaii in March 2013. This location is just east of Hanalei Bay, in an area where the real estate is a bit less expensive. Price: $247 for print alone, or $265 matted.